These groups wanted to learn about the language, the customs, and beliefs of the indigenous in order to convert us. One thing that they did was to perform plays after church meetings, which somehow was inspired by the Mexica's outdoor ceremonies (Not sure why, but I think the Spaniards were drinking a little too much holy water.). The plays would last for several days. 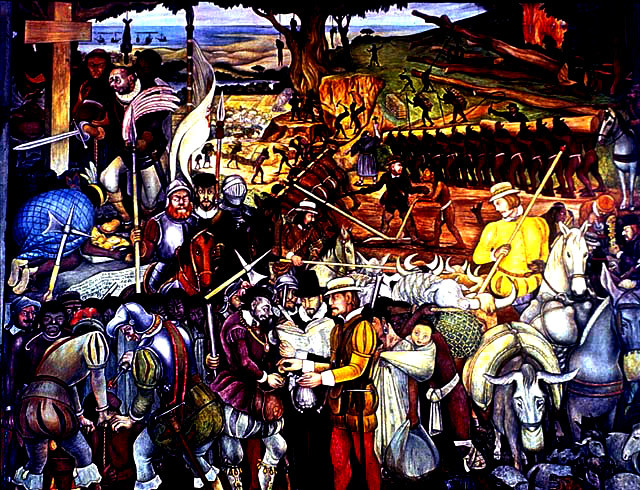 Amongst these plays were the "Conquest of Rhodes" which was performed in Mexico City in 1538 and "The Destruction of Jerusalem" which was enacted in Tlaxcala in 1539. At the end of these plays, the Christians would baptise the indigenous who either performed or was part of the audience. Another way that the Christians converted the indigenous was based on Friar Jacobo de Testera. It was to use pictures (symbols like in the codices) to represent Christian prayers. Many natives pretended to be converted so that they would not be killed. Any native who was discovered of faking their belief was burned in the town center to show the other natives that if anyone who does not convert or does not believe when they join would have the same fate. what is it that we should say? what is it that your ears want to hear? in what we say to you? what are wee to do? is it not enough that wee have already lost that our way of life has been taken away? The Spaniards strove to erase the world of ancient Mexico. The Spaniards destroyed anything that they believed was the work of the so-call "devil" and replaced it with their beliefs. The stones from the pyramids and temples were used to build the chruches. This was Corte's driving motive: to leave no trace of that which constituted the holy places of the Mexica or of any other native nation of Mexico. Malinche married another Spaniard from the Conquest. Hernan Cortes was put into prision and lived there until his death. Malinche's and Cortes' love child, Martin, went to Spain and became a knight and died in battle. Tecuichpo (wife of Cuauhtemoc) would become a Christian and have four Spanish husbands and out living them. The Spanish created Tenochtitlan in their image. The Great Temple that it once occupied was divided into lots amongst the Conquistadors. The lakes around Tenochtitlan were drained. The waterbirds and fish are no longer in the lakes. Roads would replace the dikes in Tenochtitlan. Wheeled carts and mule packs replaced canoes. In the 17th century, without the dikes, the Mexico City was repeatedly flooded. The land would become infertile over the centuries. On 1566, Alonso de Avila Alvarado and his brother Gil, sons of one of the conquistador who fought in the conquest, united with other sons of the conquistadors (including Martin, son of Hernan Cortes) and conspired against Spain. They believed that it was unjust that they had to pay taxes even though their fathers fought for Spain. They were arrested and trialed. A few days later the verdict was they were guilty of treason against the crown. Alonso and Gil were the sons who suffered the most; they lost their possessions and their lives. They were both sentenced to be beheaded in the Plaza Mayor. Their houses, which were made of the stones of the Teocalli, were destroyed. They were beheaded, 2 meters above where Coyolxauhqui was buried. 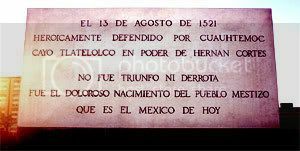 On August 13, 1790, the statue of Coatlique was was discovered at the Plaza de Armas in Mexico City. Was this a coidcidence: August 13, 1521 and August 13, 1790? The statue was placed… in one of the corners of the spacious University patio, where it remained upright for some time, but in the end it was necessary to bury it once again… for a reason that none had foreseen. The Indians, who observe all the monuments of Europeans art with such stupid indifference, came with a lively curiosity to contemplate their famous statue. At first it was thought that they were moved to this by no other incentive than national pride, a characteristic of savage no less than of civilized peoples, and by the pleasure of seeing one of the most outstanding works by their ancestors, which they could see was esteemed by educated Spaniards. Nonetheless, it later came to seem that in their frequent visits there was some secret religious motive. It was thus essential to prohibit their access absolutely; but their fanatical enthusiasm and their incredible cunning made a mockery of this decision. They watched for moments when the patio would be empty of people, especially in the afternoon when, at the conclusion of the academic lessons, all the classrooms are closed. Then they would take advantage of the silence that reigns in this home of the Muses, they would leave their towers and hurry to adore their Goddess Teoyaomiqui [Coatlique]. A thousand times the beadles, returning from outside and crossing the patio on the way to their quarters, caught the Indians by surprise, some on their knees, other prostrate… before the statue, and holding in their hands burning candles and other diverse offerings of the sort their elders used to present to their idols. And these things which were done, and later observed with care by many grave and learned persons… led to the resolution, as we said, of once more placing the aforesaid statue beneath the ground. In the 19th century the named Azteca was used to refer to the Mexica. Tlatelolco fell to Hernan Cortes. who are the Mexico of today.